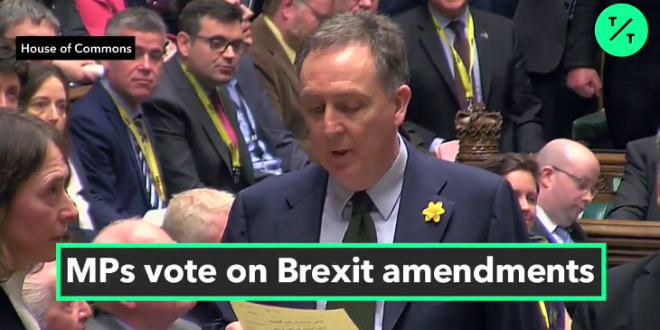 BRITAIN: Parliament Narrowly Rejects No-Deal Brexit - Joe.My.God. MPs have voted by 312 to 308 to reject leaving the EU without a withdrawal agreement. It is not a legally-binding decision – and it does not rule out the UK leaving the EU. But it means MPs could now get a vote on delaying Brexit. That vote would take place on Thursday, and if it is passed – and the EU agrees to it – the UK will not leave the EU as planned on 29 March. To leave without any agreement could mean chaos, with ports clogged, industries crippled, and supplies of some food and medicines running out. Just how bad it could be came into focus on Wednesday, when the government published contingency plans for tariffs in the event of a “no-deal” Brexit. Under a new regime, tariffs would be placed for the first time on some goods from the European Union, while some on products from the rest of the world would be dropped.